It's been a while since we called upon the robots to do some work for us, so we were very pleased when our mates at Vorwerk got in touch. If the name is familiar it's because they have, in the past, furnished us with some amazing cleaning gadgets, from the best vacuum cleaner we've ever tested, to this weird window cleaning thing. They also once sent over a robot to clean our house, which is what they were offering this time. Thank Christ - the place is total state. We check out the Vorwerk Kolbold VR300 Robot Vacuum Cleaner. 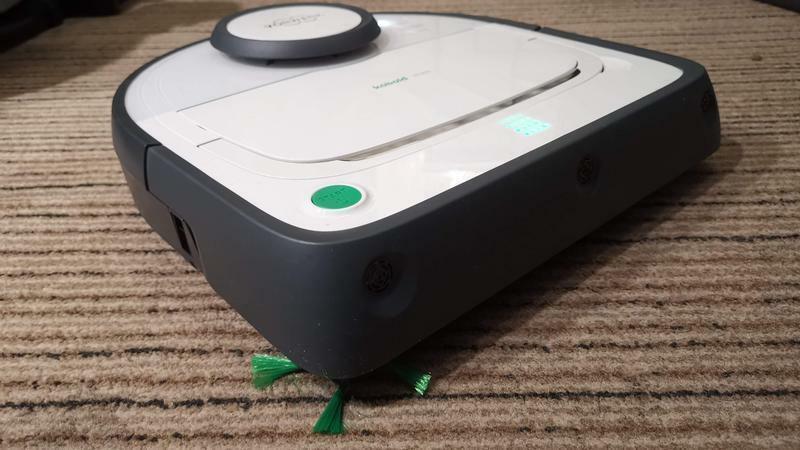 For context, check out out review of their older model robot cleaner, the VR200. We were very impressed with that, and it sucked up all our mess without bother. The VR300, however, promises to be smarter and better at navigating the average home, without looking all that much different from it's predecessor. 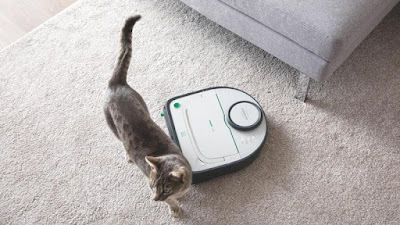 Which is fine with us, as a white robot vac really stands out from the typically black or grey market. There are other things that makes the Vorwerk Kolbold VR300 Robot Vacuum Cleaner stand out further. The rechargeable battery can last for up to 90 minutes, meaning it can cover a total area of 120 square metres in one go. The VR300 is also only nine centimetres high, so it can get under certain types of furniture, and has a maximum noise output of only 67 decibels. Just like the older version, the VR300 comes with its own app, for the usual updates, scheduling and control. However, unlike the VR200, this new version does not ship with a dedicated remote control. Not that you need it, as even direct control of the robot is handled by the app. It's one less thing to lose down the back of the sofa. 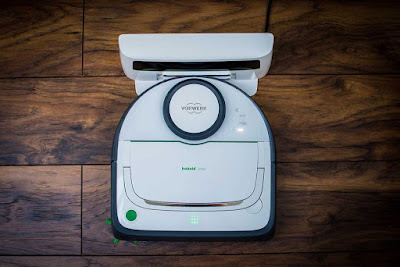 The Vorwerk Kolbold VR300 Robot Vacuum Cleaner of course has it's own charging dock, to which it will automatically drive and connect when power is low. The removable dust bin has a capacity of half a litre, which is okay - kinda. We do wish robot vac makers would invest a little more in the capacity of the bins, either making them larger, or devising a way for them to empty automatically. Wishful thinking, we know. Still, the VR300 never managed to fill the bin during a single run of the house, so having to empty it each morning (if you're running it at night, as we did) is no major task. Simple also was set up, connecting to a WiFi network, and using the app. We were happy to see maps downloading to the app once cleaning had been completed, allowing us to check that it had covered everywhere. Great also was the ability to specify in the app which room needed to be cleaned. When first set up the VR300 can be set to slowly crawl about your house, mapping the environment and regular obstacles like sofas and tables. After that it 'knows' exactly where is everything is, and can be directed to a specific room to clean. Just be aware - make sure you allow the robot to re-map the house if you move furniture around. We moved a chair one day and that night the Vorwerk Kolbold VR300 Robot Vacuum Cleaner freaked out a bit. Fun though. 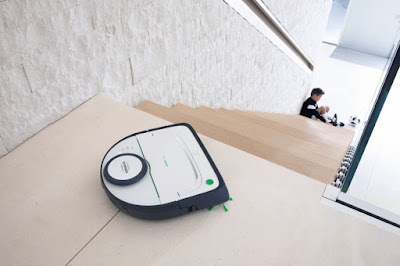 On the Vorwerk website it says that the Vorwerk Kolbold VR300 Robot Vacuum Cleaner can tackle objects of up to 2cm in height - basically being able to climb up an onto rugs, or tackle carpets edges. We'd contest that figure, as we often had to rescue it when it couldn't mount the rug in our living room - a rug nowhere near 2cm in thickness. It also had problems mounting the doormat and often left it completely uncleaned. Not a huge issue, but the mat, just like the rug, is not more than 2cm in height. A small complaint, we realise, but one that needs to be stated nonetheless. But, apart from that one niggle, we really did love having the VR300 in the house. When it worked well, it did the job without us realising each night, as it did live up to the claim of being very quiet. Also the sensor combo worked excellently at limiting bumps and bangs, also reducing the total noise. It also did a very good job of cleaning, and we found that after a week or so of nightly vacs, we reduced the regularity to every second night - thanks to the effectiveness of the suction. 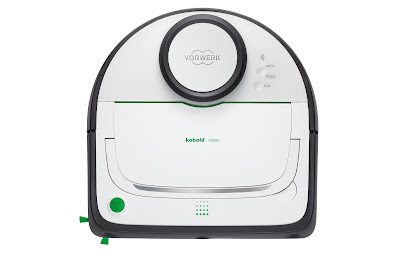 So, if you're sick of having to all the vacuuming yourself (like a damn chump) consider the Vorwerk Kolbold VR300 Robot Vacuum Cleaner.